Is a ferret right for you? Here are some ferret facts that you should know when considering a fuzzy rascal of your own. 1. Ferrets are Domestic Animals — While some claim that ferrets are still wild, this is simply incorrect. Humans have taken to ferret care for nearly 2,000 years. They are thoroughly domesticated and cannot survive well without human caregivers. 2. Diet — Proper ferret food is similar to cat food, and contains mostly protein. While special ferret food is recommended, kitten food can work in a pinch. Fruits or vegetables should only be occasional treats. 3.< Hygiene — Many ferrets love water, and proper ferret care comes with a bath twice a month. Their nails should also be trimmed every other week. 4. Play — Ferrets thrive on play and exploration. Ferret toys and crawl spaces are excellent for them, but make certain they don’t have toys that can rip apart. They love to chew things. 5. Ferret Training — Ferrets can be trained for behavior and litter box use, though it requires much patience. 6. Time — More than many animals, proper ferret care needs a large time commitment. Play should never go unsupervised. 7. Ferret Habitat — Ferret cages should have room for a litter pan, bed or hammock, and space to play. Multiple ferrets mean more room is needed. Ferret proof your cage and home as diligently as possible. 8. Health Care — With ferret care you should always pay attention to its general health. They are susceptible to lymphoma, gastrointestinal disorders, and other diseases. Regular check ups are a must. 9. 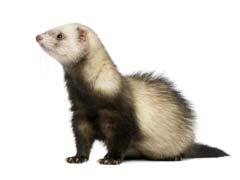 Scent Glands — As distant relatives of the skunk, ferrets have a musky odor. De-scenting is a common procedure, though the smell never completely goes away. It is simply a part of their anatomy. 10. A Bad Reputation — Always be sure to check the legality of owning a ferret in your state or county. Many claim that they are dangerous to small children, other pets, and native wild animal populations. Even though this is only fear mongering, you need to know the laws in your area.